In the Pelasgian version of the Greek creation myth, Eurynome is the name of the primal mother of the gods and dancing creatrix of the universe, who ruled Olympus as queen with her son and husband, the Titan Ophion who had the form of a great serpent. Eurynome means "wide wandering." In the shape of a dove she laid the cosmic egg containing all things in the universe. When Ophion coiled around the egg seven times, it broke into two and released the sun, moon, planets, stars, mountains, rivers, and living creatures. There is no obvious connection between the supreme goddess of creation and the grotesque male demon illustrated in de Plancy"s Dictionnaire Infernal. Often only the name of a pagan god served as the basis for a demon in the grimoires, and in most cases even the name was corrupted. Here the Greek name has survived intact, but all meaning has been lost. 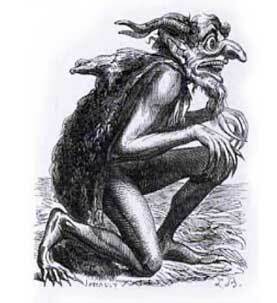 The Eurynome demon is a male demon. Back to Demon Names starting with "E"